Having lost over 20m on stage six, Sam Sunderland’s dream of repeating his 2017 Dakar victory appeared to been brought to a premature halt, but after taking a stunning stage seven win he has now put himself back into contention. 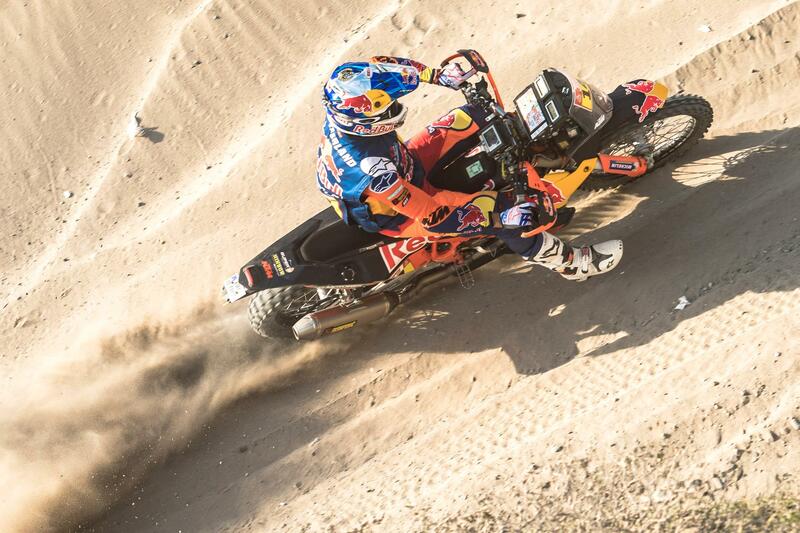 Starting the stage 12th, the factory KTM Brit had the advantage of having tracks to follow across the Peruvian desert, but it was a navigational error by his rivals mid way through the stage that allowed him to take significant chunks of time out of the race leaders. The convincing stage win means he has now moved up to fourth position 9m 59s off new race leader American Ricky Brabec onboard the Monster Energy Honda. With Max Hunt out of the race, Richard Main is the only other surviving Brit alongside Sunderland. The 53 year old Redline KTM rider ended the stage in 88th position meaning that he is now 83rd overall with three stages remaining.